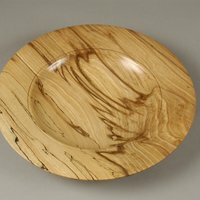 Learn all the skills necessary for turning bowls from conversion of a log to finished piece. An understanding of timber and grain orientation on the lathe, tool selection and sharpening, safe working practice, design and finishing will help you gain new skills or refine your existing woodturning skills. Over the course the tutor covers the safe use of tools and working practices; tool selection and sharpening; an understanding of the material you are working with (timber); grain orientation on the lathe; what leads to good and bad design; finishing; in this open-minded approach to woodturning. Hand-outs and reference sources are provided during the course. The tutor's approach to teaching is to be as flexible as possible, and he requests you to email him in advance with details of any woodturning experience you have to date, so that he can understand each student's needs and expectations, and tailor the course accordingly. Overall, boiler suit or smock to protect your clothes against wood dust and shavings. They should be close fitting around the neck. Please email the tutor via bookingsoffice@westdean.org.uk in advance with details of your woodturning experience to date or especailly if you are a complete beginner. Seasoned or unseasoned English hardwoods (e.g. sycamore, beech, ash) around 150-250mm in diameter and 250-300mm long or bowl blanks: at least 100mm thick, 150-250mm in diameter - if you wish to bring your own. Woodturning tools are provided at the College, however you may wish to bring any you own - especially any bowl gouges, hollowing tools, shear scrapers. The use of a selection of hollowing tools will be made available by the tutor. 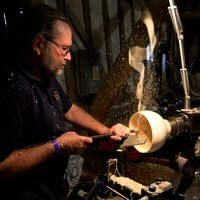 Mark Hancock, a woodturner for over 26 years, trained full time with a professional turner in 1989. He has a teaching certificate (PTLLS) along with 15 years of teaching courses in his own workshop, the USA and Europe. 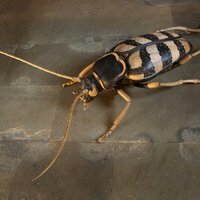 Mark's work can be seen in UK galleries and collections worldwide.